Looking for banana tips? Here you will find information about buying, storing, ripening banana fast or slow and using bananas. Also learn how to preserve bananas. Tips about buying and storing and using bananas. You may buy bananas in large quantity if you love them. Green bananas are raw and then they start to become lighter green and then yellowish as they ripen. 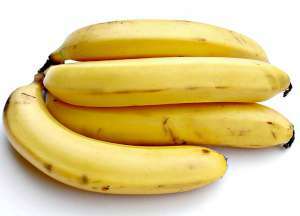 Buy bananas that have started to become yellowish. The whole bunch may not become ripe at the same time and you can eat them as and when they become ripe. Do not buy bananas if they are soft, skin is dark. A few tiny black spots are ok.
How to ripen bananas faster? When you want to ripen the green bananas faster, put them in a brown paper bag.Put an apple or a tomato along with the bananas, either in the fruit bowl or the bag. This will make the bananas ripen fast. Remember to check your bag everyday. Other wise the bananas may become overripe. How to slow down ripening of bananas? Sometimes, you may have a large quantity of raw bananas that you do not want to use immediately. In summer, hot weather, the bananas have a habit of ripening faster. The skin becomes black, the fruit softens and when nobody is willing to eat them, you have to just throw them out. You can use the following methods to slow down the ripening of bananas, to preserve and use the ripe bananas after a long time. As soon as you bring in the bananas, remove them from the plastic bag. Keep them in the open near a window. Hang the banana bunch from a hook in an airy place. This will slow down the ripening and the blackening of the skin. Do not keep the bananas in the fruit bowl along with other fruits. Put them by themselves in a separate bowl. This will slow down the ripening process. You may put the green bananas with skin intact in the fridge to slow down the ripening process. Put them in a plastic bag, zip lock and put in the fridge (not in the freezer). You may keep them for a month or more. After you take them out of the fridge, they will continue to ripen as usual. How to preserve ripe bananas for a longer time? Sometimes, you may have a large quantity ripe bananas that you want to use later. The ripe bananas can be put in the fridge(not freezer) in a plastic bag with skin intact. You may keep them for a week or longer. The skins may become black but the inner fruit is good to eat. You may also peel the ripe bananas and freeze them after putting them in freezer safe bags or a container. These can be kept for a few months or more. When you are ready to use them, defrost the bananas. Let them thaw at the room temperature. They can be added to fruit salads or in making banana smoothies, cereals or to make banana cake or banana bread. You may also make banana pancakes with these frozen and then defrosted bananas. Once the bananas are defrosted, they should be used. Do not put them back in the fridge.